What Is an XWB File? A file with the XWB file extension is an XACT Wave Bank file, a format that holds a collection of sound files for use in video games. They may include both sound effects and background music. The true source program for XWB files is the Microsoft Cross-Platform Audio Creation Tool (XACT), part of the Microsoft XNA Game Studio program. This software exists to help develop video games for the Xbox, Windows OS, and other platforms. 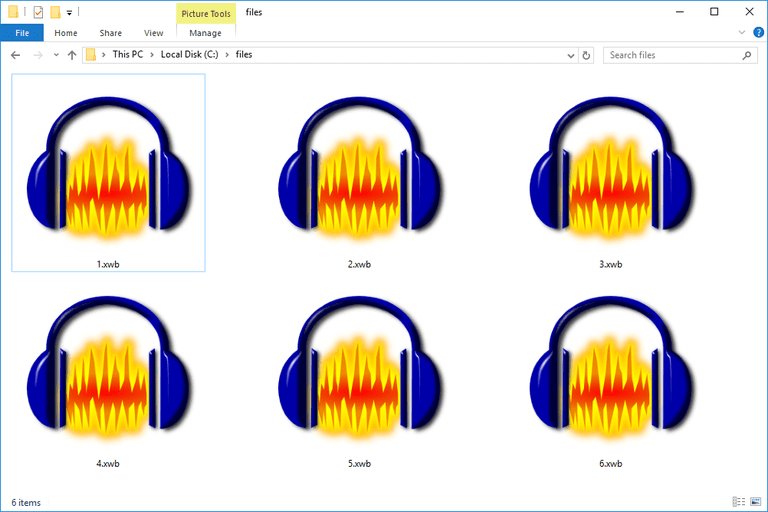 XWB files are often stored along with XSB (XACT Sound Bank) files, but they just reference the audio data within the XWB file, so they don't hold any actual audio files. Although XWB files are associated with Microsoft XNA Game Studio, "opening" one with that program isn't very practical. In most cases, what you want to do with an XWB file is convert it to a different, more common, audio file type. XWB files are usually based on some very standard audio formats (like WAV), so they can usually be played with any audio program that allows "raw" or WAV import. Audacity, iTunes, KMPlayer, and several other audio tools allow this. Once imported into your audio tool of choice, you can convert your XWB file to whatever more usable format you'd like. There are also at least three dedicated tools that may even work better at extracting audio from XWB files than the method we just described. One is EkszBox-ABX and the other is XWB Extractor (you'll need an unzip tool in order to open this one). The third program is called unxwb (XWB/ZWB files unpacker), a command-line program. See this Steam Community forum post for more help on using that tool. If you find that a program tries open your XWB file but it's the wrong application, or if you would rather have another installed program open XWB files, see our How to Change File Associations in Windows tutorial for making that change in Windows. XWB files don't need to be "converted" in the regular sense, like with a file conversion tool, because the software mentioned above can be used to either play the XWB file outright or extract its audio files. However, once you've got the WAV files (or whatever format the sound files are in), you should be able to use a free audio converter software program to convert the file to MP3 or another format. If you just need to convert a few files, an online audio converter like FileZigZag or Zamzar might be a better choice than one that you have to download and install to your computer. For example, you might use XWB Extractor to pull out all the WAV files so that you can deal with them directly. From there, you can plug the WAV files into Zamzar or some other converter, and choose an output format like MP3 so that all of those WAV files will be saved as MP3s. This is essentially the same as converting XWB to MP3, but you have to do a little work in the middle. If you still can't get your file to open even after trying these programs, be sure you aren't confusing it with a file that has a similar file extension. Two completely different file formats might use similar-looking file extensions even if the formats aren't at all related. For example, XNB and XLB files share some of the same letters as XWB files but are not audio files. XWD is very similar to XWB but requires an image viewer like GIMP. Another example can be seen with CWB files. Cakewalk Bundle files use this suffix, and while the format is related to audio files, it's not the same as the XACT Wave Bank format. CWB files open with a totally different program: Cakewalk's SONAR software.